The Phineas Swann Bed and Breakfast Inn welcomes inquiries about our inn and the surrounding area from members of the media. In addition to providing you with information about our inn, we have extensive knowledge about attractions and activities in Northern Vermont, and we would be happy to share our information with members of the press. We have been profiled in a variety of media, from HGTV, CNN and the Great American Country TV channels to New York, Boston, Bark and other fine magazines. Please contact Darren or Lynne Drevik, Innkeepers, at (802) 326-4306 or email us at info@phineasswann.com for more information. The Phineas Swann Bed and Breakfast Inn offers guests visiting northern Vermont all the charm of a Bed & Breakfast with the privacy and amenities of a Country Inn. The Phineas Swann has continuously scored a 5 out of 5 Rating on Trip Advisor. The Phineas Swann has nine rooms and suites in the Main Inn, the Carriage House, and River Cottage. Our romantic accommodations are furnished with fine antiques and four-poster beds with luxurious linens, yet also have all the modern conveniences, such as plasma televisions, Wi-Fi internet, courtesy phones, and individual climate controls. Phineas Swann offers its guests all day coffee, tea, hot cocoa, spring water, and home-baked goodies in the Living Room and all night snacks and refreshments just outside the Red, Blue, and Green Rooms of the Main Inn. Our inn is located in northern Vermont, near Jay Peak Resort in Montgomery Center. Our historic village of Montgomery is uniquely situated to allow guests to easily travel to nearby Canada as well as Stowe, Burlington, and Vermont’s Northeast Kingdom, making us the perfect gateway for points of interest in Northern Vermont. One of Phineas Swann’s unique attributes is its dog-friendly culture. Unlike other luxury inns, The Phineas Swann is a very pet-friendly inn. We welcome all sizes and breeds, from Great Danes to Chihuahuas. We also welcome guests with more than one dog. Guests often visit the Phineas Swann to enjoy the wide variety of outdoor recreation in the Montgomery, VT area. Jay Peak Resort, home to a championship golf course and a nationally recognized ski resort, is only 7 miles away. Couples find the Phineas Swann Bed and Breakfast Inn to be a wonderful choice for a romantic getaway. 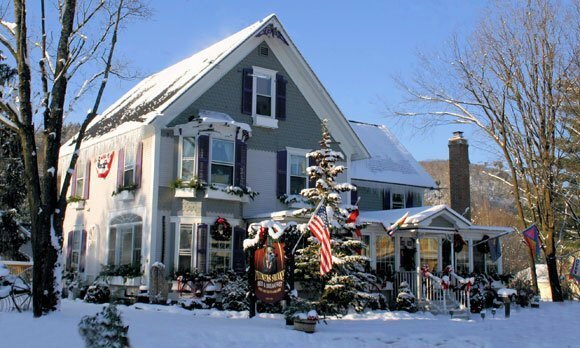 Boston Magazine has named Phineas Swann Bed and Breakfast Inn one of New England’s Top 5 Romantic Inns in their Best Winter Escapes magazine. The Phineas Swann also specializes in Intimate Weddings for both gay and straight couples. Darren & Lynne Drevik, innkeepers and owners of the Phineas Swann, welcome inquiries from the press and members of the media. Please contact us via email or call us at (802) 326-4306. Additional information about Vermont State can be found at VermontPressRoom.com, Vermont State’s official online pressroom. For additional information about Vermont’s Northeast Kingdom, please visit the Northeast Kingdom Travel and Tourism Association (NEKTTA) website, TraveltheKingdom.com.